Helliwell Provincial Park sits on a rocky headland forested with a beautiful stand of old-growth Douglas fir. Located on St. John’s Point on Hornby Island, the park was a gift to the people of British Columbia from John Helliwell. The stunning Helliwell bluffs guard the northern entrance to Tribune Bay. A recent addition to Helliwell Park is Flora Islet, which sits off the end of St. John’s Point. Flora Islet was designated as part of the park through the Pacific Marine Heritage Legacy and is one of only two locations in the world where divers can see the rare Six-gill shark. This primitive, deep-sea shark ascends from great depths to the relative shallows around Flora Islet, attracting scuba divers and marine biologists from around the world. Cliff hazards exist adjacent to hiking trails throughout the park. For your own safety and for the conservation of delicate ecosystems; please stay on marked trails and stay well back from cliff edges. Helliwell Bluffs are high cliffs; please be careful and stay well back from the edge. The high bluffs also make the park unsuitable for fishing. Helliwell Bluffs are a fragile ecosystem – please stay on trails and do not cross the roped off areas that are being allowed to naturally revegetate. The area into Lambert Channel is part of Helliwell Provincial Park. In 1997, the park was expanded to include Flora Islet, which was acquired as part of the Pacific Heritage Marine Legacy, and a large marine area. This area is managed as a marine protected area and has the following commercial fishery closures: anchovy, surf perch, pile perch, sea cucumber, octopus, scallop, squid, red urchin, Pacific oyster and green urchin. Local divers have implemented a voluntary closure on all marine life. All parks visitors are encouraged to comply with the voluntary closure. Helliwell Provincial Park is a beautiful place to visit and the parking lot tends to overflow with vehicles in the summer months between approximately 10:00am and 2:00pm. BC Parks suggests that you ride your bike or walk to the park if you must visit the park during these peak times. Alternatively, you may choose to visit the park during non-peak times in the early morning or late afternoon, and into the evening. Also, please be advised that when the parking lot is full, maneuvering large vehicles can be challenging, as the turning radius is tight. Garry Oak Meadow/Coastal Bluff habitat restoration work began in Helliwell Provincial Park March 16, 2015. Helliwell Provincial Park is located on Hornby Island, two short ferry rides from Vancouver Island. To reach Hornby Island take the Denman Island Ferry from Buckley Bay, off Hwy #19a. From Hwy #19, take the Buckley Bay exit #101. Once on the island, follow Denman Road to the Hornby Island Ferry terminal. Another 10 minute ferry ride will put you on Hornby Island; from there follow the main road to the Hornby Island CO-OP then turn left following Central Road to St. John’s Point Road to the park. Nearby communities include: Hornby Island, Denman Island, Buckley Bay, Fanny Bay, Courtenay, Comox Valley. History: Helliwell was donated by John Helliwell and established as a park in 1966. Conservation/Wildlife: The primary role of Helliwell Park is to protect rare and endangered terrestrial ecosystem elements, including old-growth Douglas fir and Garry oak meadows, and representative examples of marine ecosystems. The park contains sea bluffs and a rich intertidal zone. Helliwell Park is also an Important Bird Area that serves to identify and conserve a global network of bird habitat areas. It supports significant concentrations of birds that congregate in large numbers such as pelagic cormorants, surf or white winged scoters, glaucous winged gulls, long-tailed ducks, buffleheads, Barrows and common goldeneye and common mergansers. The park is nationally significant for the habitat of one of the last known populations of the endangered Taylor’s checkerspot butterfly. A number of other endangered plants and animals can be found in the park, which is also home to the rare Six-gill shark.Many sea birds and marine mammals can be seen from the trail along the bluff in the park. Approved Purpose Statement and Zoning Plan [PDF 291.54KB] for Helliwell Provincial Park is available online in pdf format. Kayaks and canoes can be launched along the beach for paddling around the bluffs. Helliwell Park features a 5 km loop trail leading along the Helliwell Bluffs and around through the magnificent mature Douglas fir and Garry oak forest. This trail affords magnificent views of Georgia Strait and the Coast Mountains. Please stay on trails and do not cross the roped-off areas, which are being allowed to revegetate naturally. For your own safety and the preservation of the park, obey posted signs and keep to designated trails. Shortcutting trails destroys plant life and soil structure. Jacques Cousteau rated the waters in this area as the second best cold water diving destination in the world. The clear waters provide a high level of visibility and slight fluctuations in water temperature contribute to a comfortable dive. Flora Islet is one of only two locations in the world where divers can see the rare Six-gill shark. This primitive, deep-sea shark ascends from great depths to the relative shallows around Flora Islet, attracting divers and marine biologists from around the world. 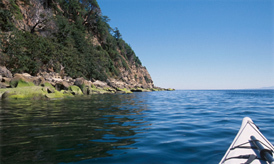 Dive shops are located on Hornby Island, and in Union Bay and Courtenay on Vancouver Island. A magnificent panorama of Georgia Strait and the Coast Mountains can be viewed from the bluffs. Seals, sea lions, Bald eagles, sea and shore birds can all be observed at this park. There are no designated picnic facilities at this park however benches are located at various spots along the trail. Pit toilets are also located along the trail and at the parking lot. An information shelter and bike racks can be found at the parking lot. There are four pit toilets at this park – three along the trail and one at the parking lot.